Today, Writer Abroad is jazzed to have Alan Paul, The Wall Street Journal's "The Expat Life" columnist, join us to talk about his upcoming book, his "rock star" fame, and how he reinvented himself from trailing spouse to award-winning columnist and band member while halfway around the world. You were a writer before you moved abroad, but it seems that a lot of trailing spouses, whether consciously or not, somehow end up becoming writers. Why do you think this is? People suddenly have a lot of time to contemplate and write at the same moment that they are feeling incredibly inspired, wired and alive. It is natural to want to capture your experiences, thoughts and emotions during such a life-changing time and to share it with friends and family “back home.” This used to lead to fevered letter writing or journal keeping, then to lengthy emails and now, of course, to blogs and tweets. I think a lot of expats start there and then realize that 1) they have a talent for capturing their experiences and 2) they really enjoy doing so. 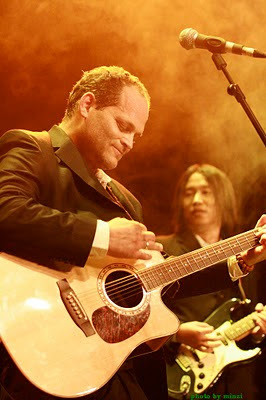 While in China, you gradually shifted from writing primarily about music (for Guitar World magazine) and basketball (for Slam) to reporting largely on your own life for The Expat Life, a Wall Street Journal online column. Was it hard to go from writing about others to writing about yourself? Not really. I had always written about a wide range of topics, though not as much professionally and I had long kept journals, which I always thought contained some of my best writing. Writing the column would have been harder and maybe even impossible, if I was not first keeping a blog. Even though I was already a professional writer, as per your first question, what really revved me up was writing for free – writing in that blog. Like anyone else, I had more time and more inspiration as a trailing spouse abroad and I just took off with it, the column was a natural outgrowth of what I was already doing for myself and a tiny audience. In the column, you wrote about the difficulties of moving for a spouse’s job. Even though you have a somewhat “portable career”, how hard was the decision to move and what ultimately was the deciding factor? I had my moments of doubt but it was not hard. In fact, I pushed my wife Rebecca to pursue the job in Beijing in the first place. There was no single deciding factor but it just seemed like a golden opportunity, truly something we couldn’t say no to. We have three kids and at the time they were 2, 4 and 7 and I knew it would only get harder to make such a move as they got older. It seemed like the perfect time for our family to make a move. We loved our town of Maplewood, NJ but couldn’t really imagine living there for the next 30 years, so this just seemed like a golden opportunity to shake things up. While abroad, in addition to writing The Expat Life column you also played in a Chinese band that was honored with “the 2008 Beijing Band of the Year”. Can you talk a bit about how you reinvented yourself abroad? I can talk about it to the tune of 70,00 words, which is what I am doing now, writing a book about my experiences, tentatively entitled Big In China. I am so deep into exploring it right now that it is honestly a little hard to stop and be pithy about it. I think that living abroad frees you from your own and other’s preconceptions about what and who you are and what you can do and not do. Some people start riding motorcycles, some bounce into dark places and have affairs, hire prostitutes or behave in other ways they would be embarrassed to at home. And some form bands. You hear a lot of second hand stories about people – especially men – behaving badly, but most people I know were channeling their reinvention into bettering themselves in some way and just simply doing more than they did before. I felt like I had already reinvented myself and stepped it up even before I formed the band – taking up hockey, writing the column, studying Chinese and learning about Taoism and Buddhism from my instructor, among other things. Music has been a big part of my life for a long time, but more as a listener and journalist. I thought I might play more in China but never could have guessed that I would find my dream blues collaborator in the form a of a Chinese guy with a tattoo of Stevie Ray Vaughan. When I met this person -- Woodie Wu – I knew that I had to explore the musical possibilities of working together. It succeeded beyond my wildest expectations. When you moved back to New York City for your wife’s promotion, was it almost harder than moving to China in the first place, after all you accomplished abroad? It was hard in completely different ways. Moving to China was overwhelming at times, in lots of day-to-day practical ways. But for me it was not emotionally difficult or wrenching most of the time because I knew that the life we left would be there when we returned. There were some exceptions, as when we had to miss important family events and especially when my father had bladder cancer. Being so far from home was quite difficult during that period but he thankfully made a full recovery. Coming back was much more emotionally grueling and complex. I did not have trouble readjusting to daily life and I was happy to be back in Maplewood, surrounded by family. But I was also in mourning for my life in Beijing because it was gone and not coming back. We had no plans to move back but even if we did, it’s a transient world and it would never be the same. You’ve said that moving to Beijing was the second best decision you ever made in your life after choosing your wife. Could you explain why? For all the reasons stated above. Rebecca and I both had tremendous professional and personal success there. In addition to everything I mentioned about myself, she was the China Bureau chief for the Wall Street Journal and led the bureau to a Pulitzer Prize for international reporting. But all this success is not ultimately the reason it was such a good decision. Rather, I think we did so well because we were so happy, inspired and vibrant in Beijing. It all fed on each other. I wouldn’t trade my time in China for anything. It was really great on every level. You won an award for The Expat Life column. Do you think living abroad helped make you a better writer? Absolutely. Once again, for all of the reasons I listed above. The first thing was just being economically liberated by an expat package, to be honest. I had been cranking out magazine copy for almost 20 years and while I still think I was doing a good job at it, all that professionalism dulls your passion a little bit. Once I no longer had to write on assignment and started writing for my blog –for me, following my muse wherever it took me – I just felt sparked and inspired. Do you think being a musician has also made you a better writer? I think so, but it’s hard for me to separate it all. Maybe being a writer made me a better musician. It all comes out of the same brain and I try to take the same approach of being simple and direct and emotionally honest. Congrats on your book deal with WSJ Books/Harper Collins. You’re going to write a book about the success of your Chinese band but ultimately about the story of your reinvention abroad. Where are you in the writing process now and how are you structuring the book? Thank you. I am deep into the writing. I’d rather not talk too much about how I am structuring because it could change. In general terms, it starts with my band’s greatest moment of triumph – playing in front of 5,000 people at a festival in Xiamen, China and looks back from there at the whole experience. I hear you have an interesting book promotion plan that includes touring with your band. Could you talk a little about that? It’s a little premature to get too detailed about this as well. I very much would like to bring the three Chinese members of my band here to do this. There are a variety of hurdles to making it happen so for now I’ll just keep my fingers crossed. No matter what, I will perform on a book tour, but I want those guys here with me for a lot of reasons. I am going back to Beijing tomorrow for eight days and will have a gig. I have a lot of work to do there and a lot of friends to see but getting together with my guys is what really gets my juice flowing. I feel like just like Elwood Blues, on a mission from God to get the band back together. Do you believe the saying, “once an expat, always an expat”? If so, how therapeutic is it to be writing a book about China as you adjust to “normal life” again? Yes, I do. And I think the expat credo should be ”do more.” We did so much more over there than we do here. There are some practical reasons – less family obligations, less community involvement, household help that frees up time now spent cooking, cleaning, doing laundry, etc. But it’s also a state of mind. So I try to keep that in mind. No matter what, I know I can do more. It is therapeutic to write about China, but I’m not sure how much it helps me readjust to “normal life.” Maybe the opposite is true. Right now, I am so focused on writing the book that I am not really analyzing its effect. I feel like I swam off a boat into the open ocean. I can’t see the shore yet but I know it’s there and I’m feeling strong. If I thought about it too much I’d probably panic and drown so I am just counting my strokes and pushing on. Mostly, just thanks for the interest. I think it’s terrific that a blog like this exists and I appreciate how well done it is. I think it’s great to cultivate a community of writers living abroad because any of us who have had this experience understand one another in some profound way, even if we are living in very different places or writing very different styles. I believe that my book will be of special interest to writers living abroad because I spend a fair amount of time talking about how keeping my blog and writing for myself liberated me in many ways and ultimately affected my experience and everything that I see and did in China. I hope to talk to you again next year when I am back on shore, with a book in hand. Anyone interested in Alan Paul's book or any other projects he is working on can follow his progress on www.alanpaul.net. Drop him a line if you have any questions or comments. He welcomes feedback and especially enjoys hearing from fellow expat writers. Thanks for the great interview and the kind words Chantal. Alan, thanks again for your time. Looking forward hearing more about the book next year. What a great interview! So many nuggets in there. But I have to highlight this one: I think that living abroad frees you from your own and other’s preconceptions about what and who you are and what you can do and not do. So true! I think that in life, in general, after awhile we take on these roles: in our families, at work, with our friends, even in our heads! Change is hard and when other people are bucking against it, it can be even harder. Being abroad (or just in a new environment) can be so freeing. Even though I love California and plan to return I know I would not be who I am today if we hadn't left 6 years ago. Sometimes I wonder if I would ever have become a writer if we had stayed. possible with it...I think you have a great knowledge especially while dealings with such subjects. Rebecca, I agree with what you've highlighted. Moving abroad, you are free to be yourself, to figure out who you really are, without the constrains of family, friends, colleagues, and peers. After all, it's hard to keep up with the Joneses when the Joneses are 5,000 miles away. And that can be a very good thing. Thank you Rebecca. That is a big theme of my book. I will have a look at your site when I get back on a good connection. And now I've found you after your finding me. This was a terrific interview. It's always fascinating to me what people say about the "re-entry" to the States after living abroad. I know very few people -- especially trailing spouses - who have been happy about it or found it easy. At this point, after nearly 20 years in the UK, I can't imagine going back to the States full time. Sue, I featured your site on my latest post. Yes, going back to the States scares me as well and I've only been abroad for four years. My mother-in-law doesn't get it. Your MIL is not alone. Most people who haven't done it don't get it. I am working on a chapter right now dealing with this. I've had few real fights with my father, but one came when he told me it was time to "get back to reality" and return from China. I was working and suddenly I visits your site frequently and recommended it to me to read also. Thanks for the insight you provide the readers. The writing style is superior and the content is relevant. Good to know. And I'm glad to hear you're writing about this. People back home think it's no big deal to just pick up and move back, they just don't get that your home is now somewhere else and is not that easy to leave. This is the perfect blog for anyone who wants to know about this topic. Please keep doing it. I agree with you that bipolar is a blessing in disguise. It has given me a greater understanding of other people in society who are suffering from mental illness, it is easier to empathize with people whose behavior is impulsive or out of their control. I also feel somewhat special, like on the outside I appear to have an ideal, polished life, when the reality is that I have ridden some wild roller coasters and have experienced "realities" that go beyond the ordinary. Even being manic in public for all to see has built up my character! a genuine more development sent by simply efficiency, nutritious higher level of competition,dissertation editing modifying different alternatives non-discrimination, and also precense in decision-making. one particular advancement based on productiveness, wholesome levels of competition, dentalessay writing sites, along with visibility in decision-making. It is a good stuff . You mansion in the top of the article up coming book Rock star. In this book has some business sell structured settlement . Can you tell me ? hanks, I've been searching for facts dentists in plano tx about this subject matter for years and yours is the best I have found so far.Bank Jobs. Very excellent work you have shared here i love your post thanks a lot. This post, I do know that your sensible information in playing with all the pieces was terribly useful. I see that this is often the primary place wherever I realize problems I’ve been looking for. You have got an imaginative nevertheless attractive way. Really liked your blog very informative and interesting facts and figures you have discussed on your blog even the comments are very helpful in enhancing the knowledge regarding this topic. The preferences indicated in the chart below closely match the numbers in last year's survey results. I am truly thankful to the holder of this website who has shared this fantastic piece of writing at here. I would also say thanks for your great blog sites its really attractive and also stuff find able thanks. Expat Life: Are you addicted?